Are there Lessons to be learned for a Brighter Future from the Past Rise and Fall of Dominica's Banana Export Trade? There was a time in the 1980s when the Windward Islands were the dominant suppliers of dessert bananas to the United Kingdom, their joint exports attaining a market share of 60%, surpassing Jamaica, the country which had had the strongest foothold in the UK Banana Market from its formative beginnings, post-World II. During this period, Dominica's export production tripled in volume, peaking in 1988 at 75,000 tons, produced by about 7000 registered farmers on an educated guess-estimation of 15,000 acres. Their output provided 70% of the island's export earnings. This "banana boom" period, when bananas were locally referred to as "Green Gold", was a period of assured preferential UK market access for the collectively exporting Windward Islands (and Jamaica) banana industries. The resultant stable and buoyant market prices brought modest prosperity to many banana-growing communities with a significant multiplier effect within the island's economies. With the advent of the Single European market, and the subsequent coming into being of the European Union, attempts were made to maintain some degree of market protection for the banana exporting producers from former European colonies in Africa, the Caribbean and the Pacific (the ACP countries) vis-à-vis the anticipated escalation of competition from Latin American (dollar-fruit) suppliers. This modus operandi was first effected by means of tariff measures and entry restrictions on dollar-fruit; eventually, the ACP exporters were offered protected import quotas. However, in 1995 the United States and several Latin American banana-exporting countries complained that the EU was breaching international free-trade legislation. So apart from the destructive potential of tropical hurricanes and storms, and occasionally intense or prolonged dry-weather spells, the banana industry had to contend with this new threat which in time became to be known as the "Banana Wars": a tug-of-war that we, and the other ACP countries, eventually lost in spite of the gallant diplomatic and public rallying fights waged by all stake holders including the Windward Island's Governments, WIBDECO & WINFA, (the islands' wholesale marketing organizations at the time), the CARICOM and the Commonwealth of Nations Secretariats, the other ACP producers, and, last but not least, the supporting banana importing/exporting European States involved. In October, 2009, it was announced that the Windward Islands guaranteed fixed share of the EU market was going to be abolished and subsequently, the EU existing market-management arrangement with ACP banana exporters, including Dominica, was by then almost completely dismantled. It was inconceivable that The Windward Islands' Banana Trade could ever become a competitive match to the banana exporting countries of Latin America: countries with alluvial plains of exceptionally deep fertile soils, expansive flat land (banana cultivations that stretch as far as the eye can see), an abundant supply of cheap labour, economy-of- scale advantages inherent in large-scale production, timely infrastructural/technological investments driven by the innovative prowess of well-financed and well-staffed R&D departments, and other State sponsored research agencies. Nevertheless, there was cautious optimism that given some time to get its house in order the Windward Islands Banana Trade could retain a viable foothold, at least, in the UK segment of the EU market, as there were some old and new market trends that favoured the smaller banana producers, like those of the Windward Islands. In the UK, marketing research confirmed that there was a strong consumer preference for Windward Islands bananas, both in taste and size, and the exchange rate between sterling and the EC dollar was mostly a favourable advantage to the local segment of the industry. There was also, from the mid '90s, a growing goodwill sentiment among an increasing number of European consumers in support of the smaller producer, consumers willing to pay comparatively higher retail prices for bananas sourced from Fair-Trade, and other such European movements, aimed at helping the smaller producers and their associations to engineer/negotiate better trading conditions for their more ethical means of production. Furthermore, the Windward Islands were still free of the dreaded Black Sigatoka disease, a disease that had not been eradicated (the exception being Queensland, Australia) in any banana exporting country. It can be effectively controlled, albeit, at a much higher treatment/labour cost than the existing Yellow Sigatoka (known locally as Leafspot Disease) or by new genetically engineered banana varieties (but commercial application remains controversial). Both the Black and Yellow Sigatoka are now present in all the Windward Islands (and the neighbouring banana exporting French islands). The high-light of this period for the banana industry, from the '80s to the '90s, was the significant and sustainable strides made in upgrading fruit quality standards and quality output consistency to a level, more or less, on par with Dollar-Fruit standards on the UK/EU market. But farm productivity in terms of banana yields stubbornly remained more or less the same; no sustainable increase from the national average of 4-5 tons per acre per annum – In spite of substantive investment, deployments of both financial aid and technical support, largely from STABEX funds in support of the industry's quest to become more competitive by improving the production volume and efficiency of its supply chain. Nevertheless, as a result of major Windward Islands industry's banana development programmes, and especially the deployment of a specialized Banana Technical Advisory/Extension Service, the average yield of the industry's core block of producers (a category of growers producing 75% of the island's export production) increased, on average, to over 7 tons per acre per annum – but such progress was relatively short-lived. It should be noted that the best tropical export production (mono-cropping) performance under rain-fed conditions (given adequate/optimal crop husbandry) is in the range of 15-17 tons per acre per annum; only a few banana farmers attained this level of crop yield on a sustained basis in Dominica under similar rainfall conditions. Sustained crop yields from irrigated high-intensive production is in the range of 20-26 tons per acre per annum. It was the introduction of a new harvesting/packing technology that largely transformed the quality output of the Windward Islands Banana Industry, and which enabled farmers to achieve their highest margins (financial returns) from bananas, resulting in a dramatic upswing in the island's banana exports in the latter part of the 1980s. It was known as "Field Pack", conceptualized by the specialized banana advisory/extension service in Dominica, and developed by the technical/research staff of WINBAN (forerunner of WIBDECO) and Geest Industries (the former shipping/marketing agent), both headquartered in St. Lucia. Field Packing technology was highly appropriate for the mini-scale banana production peculiar to the Windward Islands. Essentially, a portable harvesting/packaging system, without the need for running water. All fruit treatment and packaging materials was brought into the banana fields, and all related harvesting/packing operations undertaken directly in the field; the harvesting/packing team(s) moving from tree to tree being harvested, thereby minimizing significantly the handling and manual conveyance and/or trucking of the naked fruit. On-farm storage sheds had to be built to store, protect and secure all harvesting/packaging materials and the packed cartons for shipment. Prior to field packing, harvested fruit was processed and packed in a "Boxing Plant" – a factory-type operation processing relatively large volumes of fruit within a short period of time in the banana catchment areas to permit timely post-harvest (on-ship) refrigeration in order to avoid ship-ripes and premature ripening leading to unsaleable distribution waste. Before the introduction of box-packing technology whole banana bunches, later padded-wrapped, were exported. Fruit quality standards were low and wastage levels high during this early period of the industry. However, the availability of running water was a necessity for boxing plant operations in order to be able to clean soiled fruit, but more importantly to prevent/minimize stains, blemishes and bruises, highly conspicuous on the yellow (ripened) fruit, as a result of the natural latex exudate of the green banana, a problem when banana bunches are dissected into banana hands/clusters for tight packing into fibreboard cartons to a pre-determined weight for effective shipment, handling and marketing. The flowing water, running throughout the length of the plant, acted also as a conveyor belt for the floating fruit hands/clusters being processed for packaging. Another pre-requisite for the boxing of bananas was the application of fungicides in order to prevent the rotting of cut crowns as a consequence of the de-handing and/or clustering of the fruit, as well. However, this boxing plant technology, originally designed for large-scale, on-farm harvesting/packaging of bananas on vast expanses of flat land, was transferred to and adapted in the Windward Islands without its precursory bunch-carriage cableway system. This aspect of the technology in general could not be effectively implemented given the level of farm fragmentation, the relatively small size of banana cultivations, and the highly dissected and variable terrain that is, more or less, the norm in the islands. The banana cableway system allows for the free-hanging conveyance of the harvested bunch from the field directly into the on-farm packing plant with the minimum of manual handling. As the volumes and competition from Dollar Fruit imports into the UK increased by the early 1990s, the large retailing Multiples became more and more dominant in the market place, eventually superseding entirely the smaller green grocery shops and barrow-boys. With their focus on consumer self-service of aesthetically displayed products, they encourage and demanded that ACP Producers, like Dollar Fruit producers, process and package for export, banana "clusters" instead of "hands" – as clustering of hands had to be undertaken, increasing cost, in the UK distribution centres to satisfy market demand. Consequently, the Field Pack technology gradually became obsolete as the method of Latex control and Crown Rot diseases control employed in this technology could not be effectively applied to the packaging of fruit clusters. The "Field Pack" was replaced by the "Mini Wet-Pack" which utilized a limited supply of stored water, applicable to farms without the availability of running or pipe-borne water. Nevertheless, this fruit-processing/packaging technology required a lot more substantive on-farm infrastructural investment, and more skilful and costly to operate in terms of its labour demands. This processing method enabled not only the packing of banana clusters, but allowed cluster-size sorting and packaging categorization at the producer end, facilitating direct brand packaging on behalf of specific retailers to be better able to satisfy their particular market niche. However, further demands were made on farmers to elevate their farming operations to a higher sanitary level in protecting the environment, the health of farm workers and consumers with a stricter product traceability from the market end to the original producer. Another major introduction in the 1990s (by then universally adopted by banana exporting producers) was the deflowering of the bunch, colour-coding and the bagging of bunches with plastic sleeves just after fruit emergence. This practice further enhanced fruit quality by protecting the developing bunches on the tree from field scars and blemishes, and enabling mature bunches to be harvested at the optimal age and grade, to avert premature ripening of the fruit, in relation to the particular distance of the market. This measure also improved accuracy in production forecasting for shipping and retail distribution in the market place, which for the Windward Islands was a major source of financial losses when export projections turn-out to be grossly inaccurate. However, this farm operation did not attain the level of timely and dedicated application comparable with that of the large-scale plantation management operations of Latin America, and consequently, did not have a significant financial impact on the local industry as anticipated. To become more competitive in the market place the local banana industry had to increase production vertically, (that is, by increasing crop yields per acre) rather than horizontally, (the increasing of production volume by expanding cropping acreages) in order to reduce substantially the cost of the industry's infrastructural & administrative overheads and essential grower-support services (including Sigatoka control) by achieving productivity gains from economies of scale and selective land-use suitability for more intensive banana farm production. The existing level of farm productivity had to be at least doubled. But that goal was not met. To illustrate, If the national average yield had reached 10 tons per acre, it would have required not 15,000 acres to export 75,000 tons, but 7500 acres; what a difference this could have made in reducing the cost of Sigatoka control, for example. 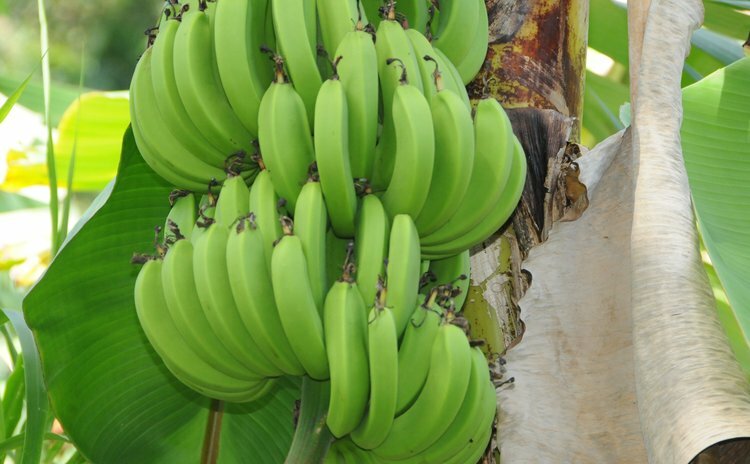 In Dominica only a few farmers, a dozen or more, were able to produce bananas consistently in the region of 15 tons per acre under rain-fed conditions. Attempts to introduced irrigation in bananas in Dominica was unsuccessful. In neighbouring Martinique, yields in the region of 25 tonnes, up to 30 tonnes, were achievable under irrigation, an island in the same climatic zone as the Windward Islands. So the environmental potential was similar, but not the operational capacity. After the peaking of banana exports in the latter part of the 1980s, exports more or less plateaued in the region of 30,000 tonnes in the early 1990s (that, is during the transition of field packing to the Mini wet-Pack system). From then on, the island's banana exports steadily declined from 28,100 tonnes in 1997, to a little over half this tonnage in 2004, and continued on a downward spiral to the extent that Dominica today no longer exports bananas to the UK. However, the shipping of bananas from Dominica to the EU is still feasible, and stringent efforts are being made to resuscitate the UK banana trade but which presently relies heavily on Government subsidies, namely in fertilizer inputs and the control of the Black Sigatoka. It would be in our interest as a nation, as a mountainous island, where just over a quarter (26.7%) of its total land is cultivable, not to ignore lessons that can be learnt from the rise and fall of the Windward Islands- UK/EU Banana Industry to guide us in our future agricultural pursuits and export challenges, and to move away from mono-cropping to more appropriate conservation farming for small-scale diversified production.